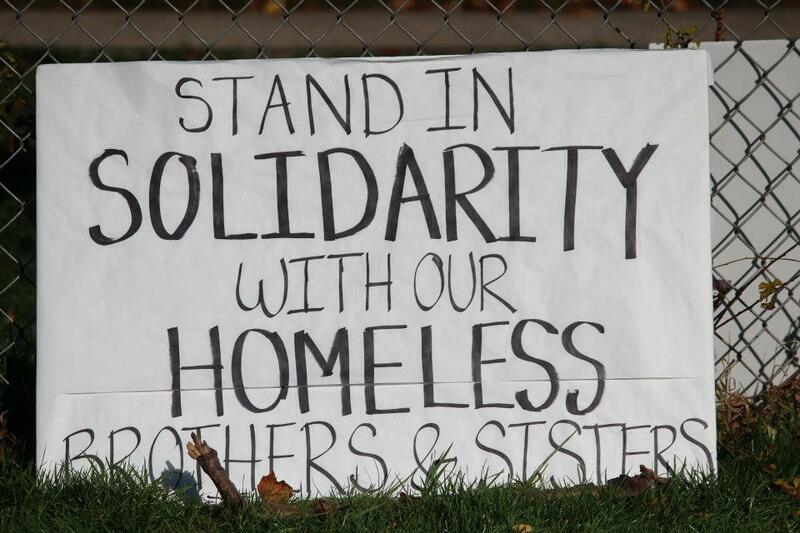 Stand in Solidarity with Our Homeless. Photo by Callen Harty. I am unable to attend this evening’s committee meeting at which you will discuss Mayor Paul Soglin’s proposal to add a security guard to protect the City County Building and its employees from the threat of homeless citizens who come to the building. He is also proposing to make it a crime to trespass in the building and to redefine that as being in the building with no apparent business with either the city or the county. I am disheartened by this latest mean-spirited proposal. The mayor’s proposal does not indicate what the supposed problems are or the supposed threat to public safety. It simply presumes problems and threats without any evidence to back it up. If you’re going to suggest spending additional money on security and changing long-standing rules it seems there should be more detailed information as to why that is deemed necessary. It also seems that whatever these issues may be they could be dealt with under the current rules and laws without making it difficult, if not impossible, for any homeless persons to enter the building. Over the last couple years both the city and county have failed at dealing successfully with the underlying issues of the causes for homelessness. There was supposed to be a day shelter in place by now, which would have contributed greatly toward eliminating the issue of homeless people inhabiting the City County Building. Without that day shelter or other options what would you have our homeless brothers and sisters do? Where would you have them go? Mayor Soglin finds the easiest solution is to put blinders on and try to make the homeless disappear from the view of those who most need to know that there are many homeless individuals and families in our city. He has previously been quoted as saying that he’d like to ship them all out of the city, which wouldn’t take care of the underlying issue either, but instead lay the burden of it upon others. I expect more from a leader than this kind of sleight-of-hand. I expect first of all a little more empathy. Put yourself in the place of someone else. Imagine what you would do if you found yourself without a job and home. Where would you go? What would you do? I would go to the City County Building, the Library, the Capitol, and any other public building I could find during the day to stay warm and to feel at least somewhat protected from the elements. I don’t believe we can change the rules and take away one of the few places where these people can go and feel safe. If the mayor thinks he feels unsafe in the building just imagine how unsafe these people feel out in the elements. Whatever problems there are (if indeed there are any) with the homeless at the City County Building they are not going to be solved by removing them from that one building. The core problems will only be solved when we eliminate homelessness. Instead of trying to push the homeless out of direct view let us look at ways that we can help. While it may be a pipe dream to think that we can end homelessness it should not be a dream to imagine a better way, to look at what the city and county can do for the homeless rather than to the homeless. I ask that you defeat this latest proposal and instead focus on resolving the underlying issues of homelessness, poverty, income inequity, and more. Focus on what we can do for these people. Find ways to provide housing or at least assistance in getting people into homes instead of out of public buildings. This entry was posted in Uncategorized and tagged Capitol, City County Building, City-County Liaison Committee, day shelter, Homeless, Library, Mayor Paul Soglin. Bookmark the permalink. It would also be helpful if the shelters that exist relaxed their rules about making people leave during business hours (or dawn until dusk). There is a shelter run by the Salvation Army a block from where I work. On even the coldest days of the year the shelter requires all to leave during the day. There have been two cases in the past decade where homeless persons have died on one of the small islands that dot the Wisconsin River in the downtown area and then not found until the spring thaw. It’s heartbreaking.. Unfortunately, our mayor here in Portland is doing much of the same regarding our homeless, too.